Is there value with holding international bonds? There are a number of reasons for holding international bonds. It will be some variation on diversification, but as yields have fallen the risks have changed.There is no yield cushion, so investors are making a directional view on rates and currencies. If you don't have a view, there is no reason to hold international bonds. Look at the Bloomberg Sovereign Developed Bond index ex US as a simple benchmark. The current yield to worst is 45 bps compared with the index yield with US bonds of 72 bps. Investors are losing close to 30 bps by going outside the US. The OAS to US Treasuries is 22 bps for a portfolio of AA- credits. 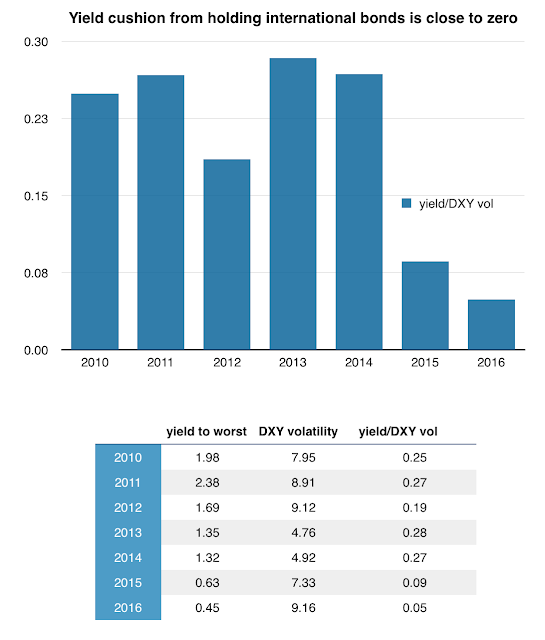 A table of yields since 2010 at the end of February compared with the dollar index volatility for 100 days shows a decreasing ratio of yield to FX risk. FX volatility is higher and the yield cushion is lower. The yield to worst has fallen 150 bps in six years. The yield covers 5% of one standard deviation in FX risk. The numbers are worse if you are buying new issue bonds in the EU or Japan. Clearly, you don't have to discuss a dollar safety strategy. Foreign investors get better yield from holding US bonds. Investors are taking on FX risk and interest rate risk and not receiving any yield for the "diversification". Investors may want to hold foreign bonds if there is a view that the Fed will raise rates relative to the rest of the world, but then there will be the expectation that the dollar will strengthen on better US growth and the positive interest differential. The investment call is based on relative monetary policy and the expected reaction in the FX markets, duration risk versus the impact of FX flows. Everyone talks about the retune to risk trade-off, but it is a concept that is at times hard to visualize. 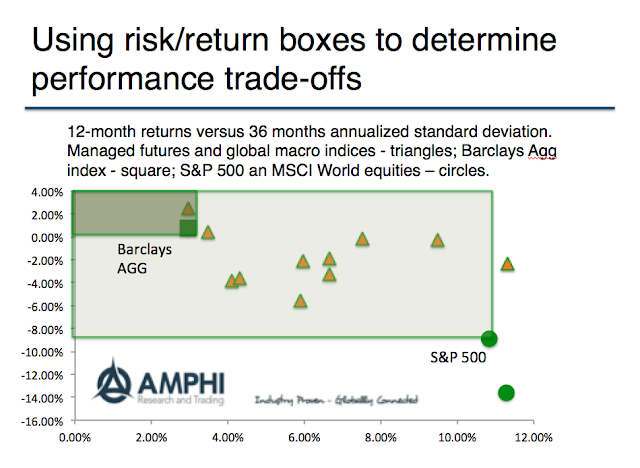 A simple tool is to form return to risk boxes with well-known benchmarks. The return to risk boxes represent the area of higher return and lower relative to some benchmark. 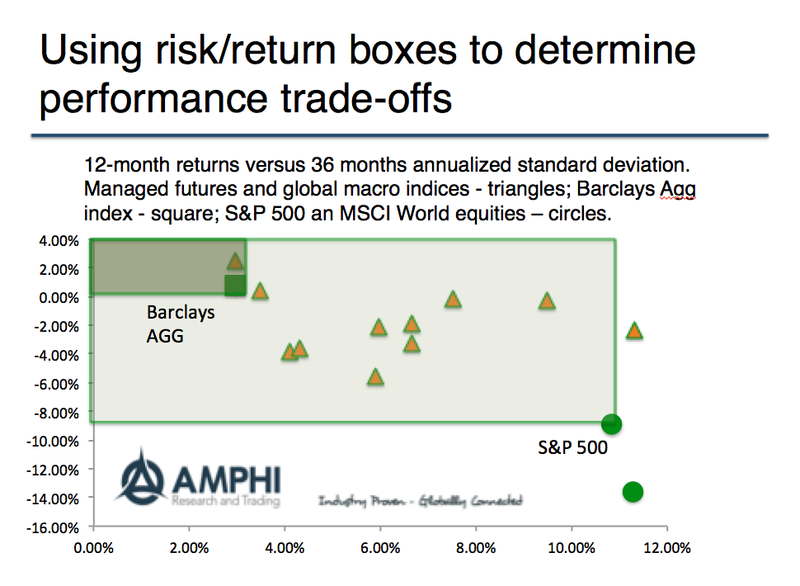 If you are in the box, you have a better return to risk trade-off. If you are outside the box, your return to risk is inferior. You can look at a large number of managers or indices in one graph through the box approach. In the graph above, we have included global macro and managed futures indices as well as the S&P 500 index (green circle) and Barclays Aggregate bond index (green square) for the last 12 months of return and 36 months of volatility. The triangles represent the major managed futures and global macro indices. We have not labeled them to make the graph a little cleaner. The other green circle is the MSCI world index. The graph tells a very interesting story. All but one index shows a better return to risk than the S&P 500 even though the returns were flat or slightly negative. Relative to the bond index, managed futures and global macro did not do as well. Most indices were inferior with only one adding return value. These numbers will change over any period, but this graph shows a bond-macro combination was superior to a bond/equity combination. If you are an allocator to global macro strategies, you have to make some assessments on the relative opportunities across asset classes. Choices have to be made. 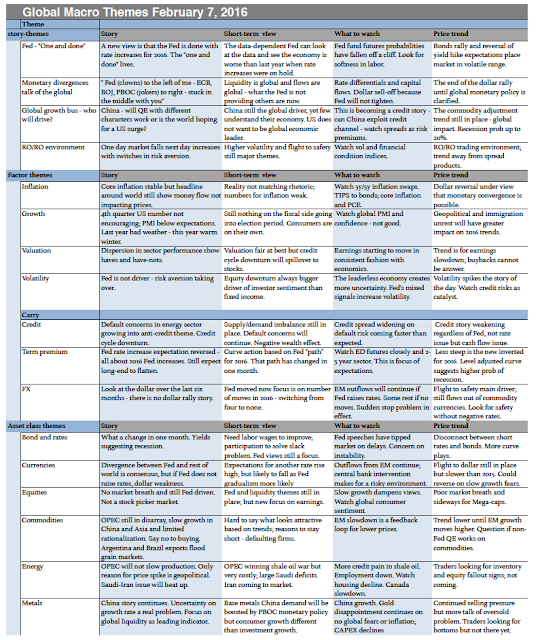 Someone asked about our view on which sectors have better opportunities, so we developed a simple table of opportunities by sectors. In the post 2008 period, there was limited moves in foreign exchange, so even if you picked the best FX manager, you would not have done as well as just holding beta exposure in equities. Being long-biased in commodities was horrible in the post crisis period. Trying to trade short rates would have gained limited money. Fixed income generated gains. One of the key determinants of where to put capital to traders is volatility. Not standard deviations but spreads from market moves. Although it may seem counter-intuitive, asset classes that are subject to large moves offer better opportunities for traders. Sectors which have little volatility make it harder to generate gains. There may be better signal to noise in low volatility markets, but the size of the moves may be smaller. Higher volatility offers better potential gains. Willy Sutton, the bank robber, wanted to visit banks. Firemen are attracted to fires. Lawyers want have clients that need legal advice. Doctors want to help sick people, and traders want volatility and price moves. Low interest rates have a negative effect on many financial institutions. Negative rates only make it worse and highlight some significant problems around the globe for financial services. It creates odd incentives and will destroy portions of the financial markets. 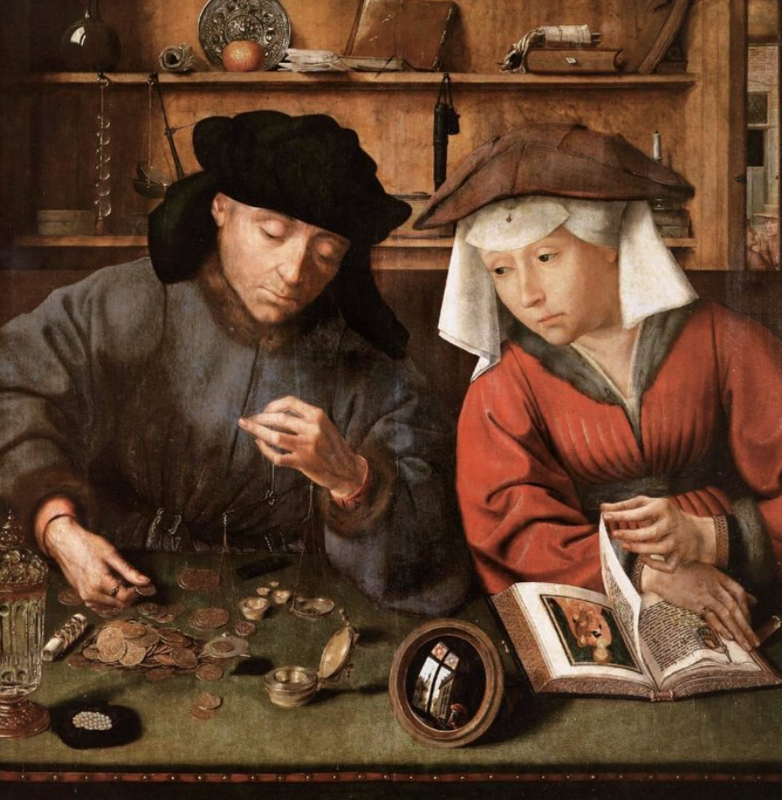 The poor economics of some of these businesses may lead to radical change in the financial industry. Money market fund and bond funds are not viable businesses and may do nothing for investors. 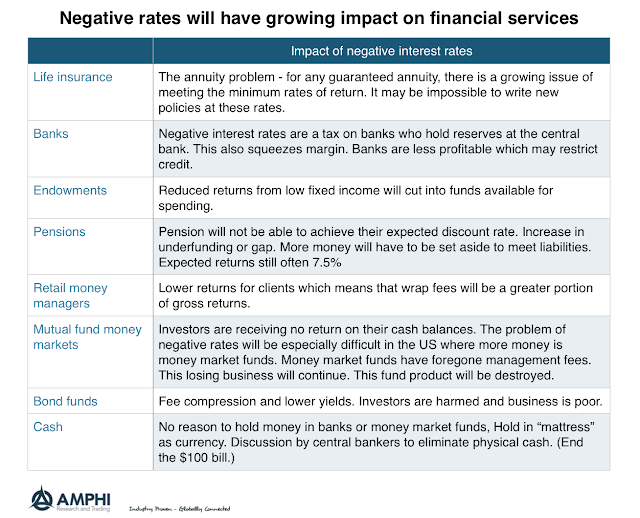 What fee should pay in a negative rate environment. You are already being charged to hold the bonds. 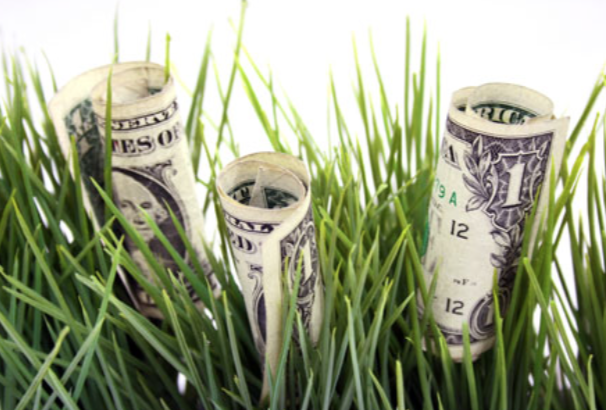 The guaranteed annuity business in many countries is gone. Many life insurance products do not make sense. Pensions will not make their expected returns. There is no way they can make their expected discount rate. Banks are not going to be creating new loans in the current unprofitable environment because their margins are being further compressed. Banks were saved in 2008 with lowered rates. Now they are being destroyed. 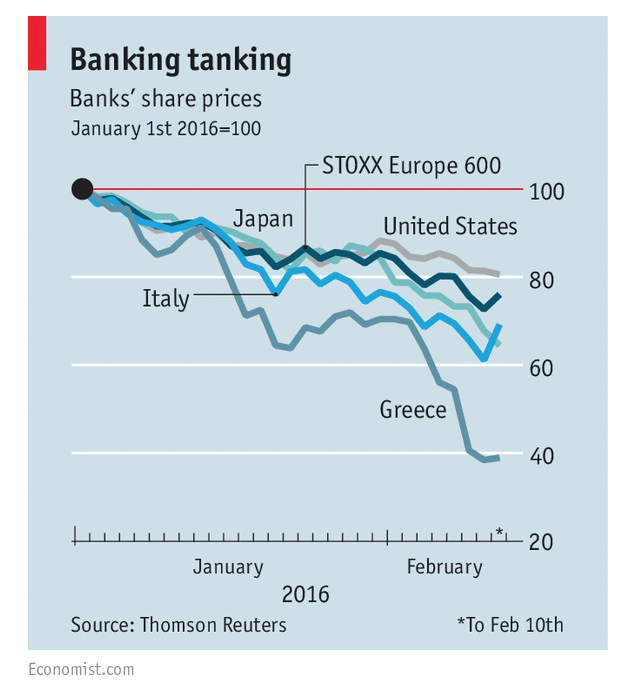 Short of charging all depositors, EU banks are being taxed with negative rates into oblivion. Finally, the natural conclusion of negative rates will be to eliminate cash which receives a zero rate of return - much better than a negative yield. Some central bankers have started to call for an end of cash. If we have cash, it should only be in small denominations. There is place for savers and no place for financial service providers. Investors have be abuzz with talk about the good performance for managed futures so far this year, but this performance should be placed in perspective. First, the best month over the last twelve for managed futures and global macro was generally last January. Second, most of the global macro and managed futures indices are below their high water marks for last twelve months. It is not too late to invest. 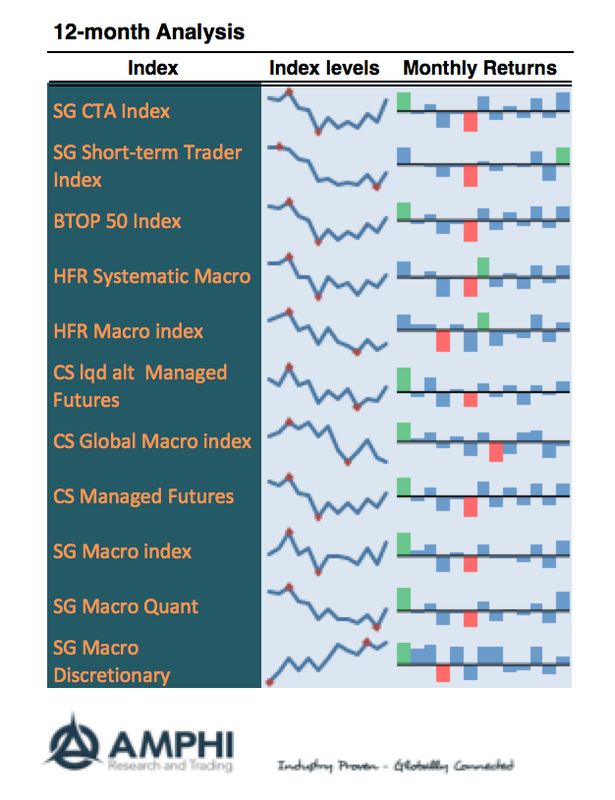 Third, global macro discretionary have done better than managed futures on a risk adjusted basis. 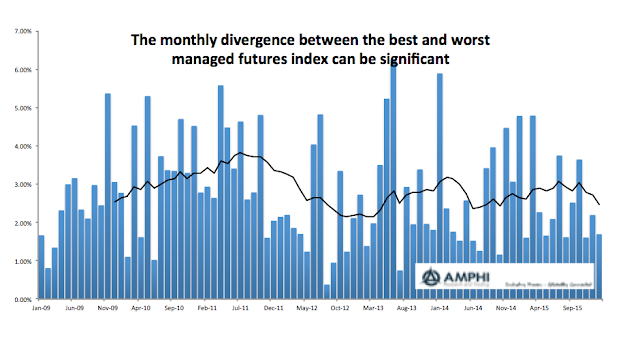 However, managed futures has done better than many other hedge fund styles which have been disappointing investors with their flat to negative performance of the last year. The key allocation decision for alternative investments this year may be focusing on style differences that focus away from equity trading. 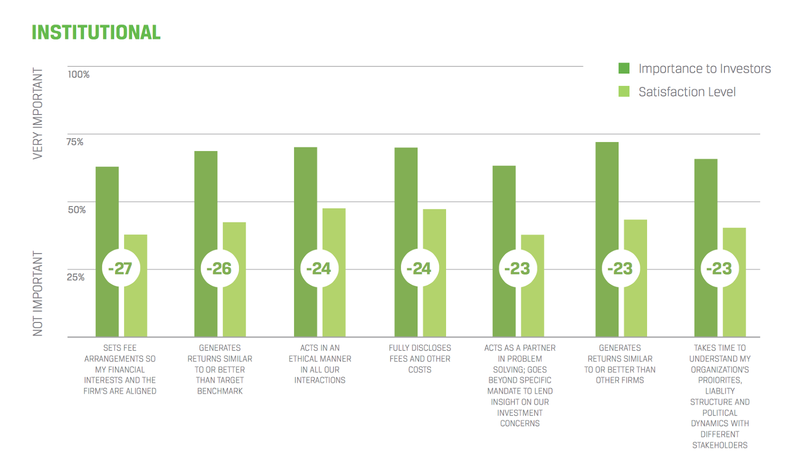 How do you grade your CTA portfolio or an individual manager? A simple way compares manager or portfolio performance with a benchmark. Unfortunately, there are wide variety of benchmarks, so performance result may differ based on the index chosen. All of these hedge fund benchmarks are representative samples of large managers equally weighted or weighted by assets under management, but even with a large group of managers, there will be large performance differences. Many will argue that of course there will be differences, but the size of these differences will not be economically meaningful because all of the benchmarks closely track each other. This is not the case as seen in our first graph. There can be wide differences in cumulative return. The differences or spread usually get much large when there is a crisis period. Those indices that have a high trend tilt or more crisis beta will move ahead of the other benchmarks. The difference between the high and low monthly performance of the benchmarks can be substantial. The dispersion can be over 3% in a single month. This is not the difference between managers but differences in the benchmarks. The cumulative effect of these differences can be huge. In the third graph, the average of the managed futures indices is presented in the blue shade. Much of the return advantage is diversified away and the result is flat performance. If an investor received the worst performance of any benchmark each month, the net result is a huge drawdown. Similarly, if an investor was able to be in the best performing index every month, the performance would have made him a superstar fund manager. This is an exaggeration, but it illustrates the value of picking the right managers. Choosing the right mix of managers matters. Even allocating to a group of the largest managers can result in under-performance if the choices are poor or switching is done at the wrong time. The CFTC and the European Commission agreed on a framework to recognize each other’s clearinghouses, central clearing counter-parties (CCP’s), as subject to the same regulatory oversight. The question comment from many traders is likely to be, “So what”. Well, this is a big deal. If this was not done, then US clearinghouses would not be qualifying CCPs under EU law. The impact would be that European banks carrying positions there would be subject to a penalty capital charges. Now, under this agreement, the European Securities and Markets Authority (ESMA) can authorize a US derivative clearing organization (DCO) as an equivalent to an EU qualifying CCP for bank capital requirements. The equivalence will occur if the US DCO’s provide for three changes to make them similar to EU CCP’s. European CCP will now have to meet all of the requirements of a derivative clearing organization (DCO). This goes a long way to standardizing regulation for CCPs around the world and will reduce regulatory uncertainty. 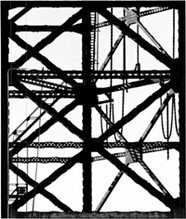 Of course, greater standardization means that there will be less innovation of opportunity for new approaches to risk management. Nevertheless, we believe that this accord will have a strong impact on futures customers and the result will not good. Costs will go up either through increases in margin required, shuffling of FCM players, or implicit expenses because the FCM will have higher costs. Having house accounts hold more margin will make being a prop trading clearing firm more expensive. It is not clear that holding two-day margin will protect the market in a crisis. There is also a carve-out for agricultural positions. 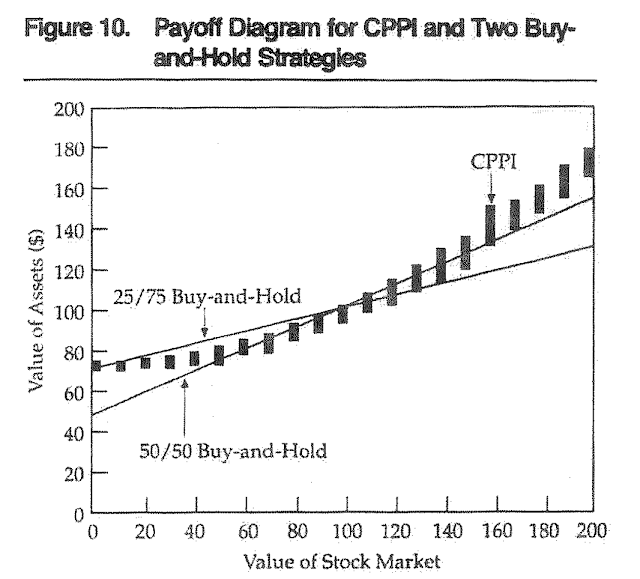 Having more pro-cyclicality in margin models is not easy to solve except by raising margins. Forcing "cover 2" default resources means that DCOs will want to have less FCM concentration. They should want to make being large more expensive. More diversification of FCM is good but in the near-term smaller clients of the largest FCM may be at risk. The law of unintended consequences will show itself as these rules are implemented. Now matching importance with satisfaction is not precise or easy to measure but the survey sends a clear signal that money managers are not doing a good job at providing trust levels that investors find satisfactory. The survey shows that trust of money managers by retail investor is slightly higher than the last survey in 2013, but the level is barely above 50%. It is a sobering thought that managers who investors give their money to are not their most trusted service provider. The survey also shows that only 41% of institutional investors will recommend an investment firm they work with to other investors. The survey goes not to say that while underperformance is the most likely reason to leave a manager lack of communication and responsiveness is also in the top 5. Investors do not live on performance alone. More is always better especially if it comes to data. Unfortunately, that may not the case. A recent paper called "Too good to be true: When overwhelming evidence fails to convince" suggests that if data is overwhelming in favor of a choice, there may be a problem. Too much confirmation evidence should reduce confidence and suggest that there is a hidden bias. Call it the "paradox of unanimity"
This is a complex issue associated with Bayesian decision-making, but think of it this way - if you have overwhelming data supporting an argument, it may just mean that the data is not independent but closely correlated or biased. You are pulling from a single group that does not provide enough diversity or the data are actually suggesting that the test is not true. 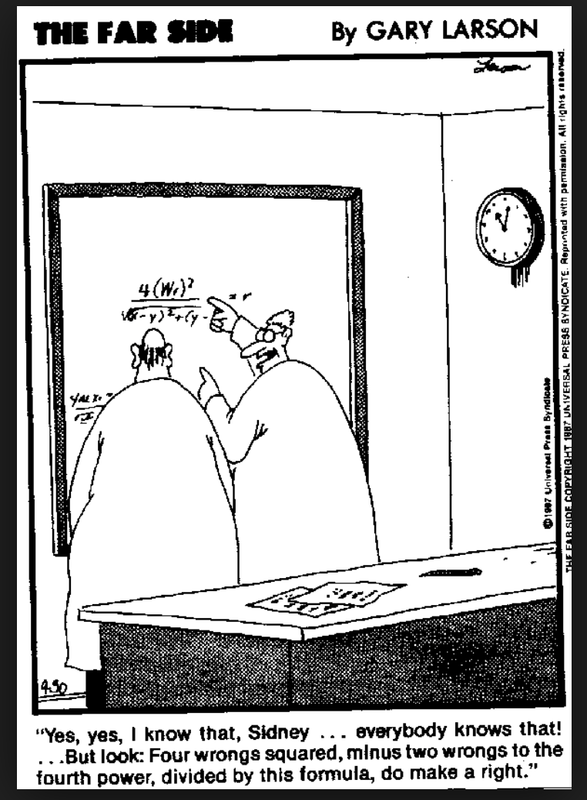 Why is this important for quant analysts? There is a clear focus on the power of tests and the ability to have confidence in a conclusion, but you should be aware that there could be data that are too good to be true. For example, if there a random police line-up and large number roof witnesses all agree on the same person, there is a likelihood that the test was not random but has a bias. In this case, agreement suggests less certainty. We can be less certain of our conclusions if there is complete agreement. While not directly the same, as the adage goes, "If everyone is thinking the same, then someone is not thinking." Portfolio insurance - Back again? I have seen some discussion in the financial press and from clients about portfolio insurance in the last month. This does not make a trend, but it does seem like a flash from the past. I lived the craze of portfolio insurance during 1987 and the end results during that crash were not pretty. Nevertheless, there may be a place for revisiting this strategy if it is placed in the proper context of asset allocation. The rationale for portfolio insurance strategies is simple - there is a need for positive convexity to help when markets can move to extremes. You can go back almost 30 years to get a good feel of the foundation for this key asset allocation issue. See Perold and Sharpe - "Dynamic Strategies for Asset Allocation". Think of portfolio insurance from a high level - an investor is trying to replicate an option through holding exposure in a risky asset and bonds. Hence, when the market goes up, you want to put on more risk exposure and when the market goes down you want to limit or cut exposure and switch to bonds. If you increase exposure in an up market and decrease it in a down market, you will get the non-linear pay-off of an option. In a simple form, convexity can be achieved through not regularly rebalancing a portfolio. When you rebalance you will take exposure from those asset classes which are doing well and place it in the asset classes that have under-performed. This creates negative convexity and has value if the markets do not move to extremes but if there are extended moves, there is value doing the opposite. Letting exposure ride when they are trending up is a momentum strategy. Momentum will give you positive convexity in up markets. If you cut exposure in down trending markets, you will also get convexity. 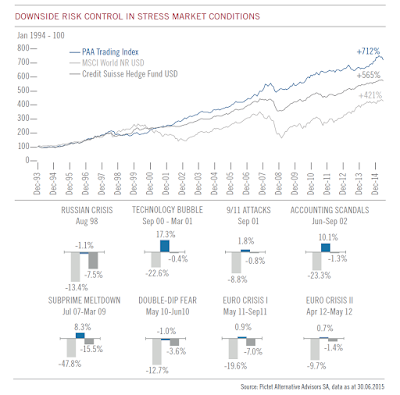 The important part of portfolio insurance is reducing risk exposure in down markets. If the market moves to extreme you don't want to follow a strategy of rebalancing toward that asset class. It seems that many investors have a problem with this allocation process, but you can get some of the same result with the choice of hedge funds added to a portfolio. Managed futures through trend-followers can be a key source of positive convexity across a broad set of assets classes. In fact, investors are paying for the diversification and search for trends on which to run positively convex exposures. A trend position in a market with stop-loss risk management is a simple form of portfolio insurance. Implicitly, increasing managed futures and global macro exposure is a diversified portfolio of portfolio insurance strategies. You may be holding this old strategy without even thinking about it. The word bank is supposedly derived from banca, the Italian word for counter; bankrupt may be a corruption of “Banca Rotta” or broken counter. With the significant decline in COCO bonds, the rise of CDS spreads for banks, and the large amount of NPL's at EU banks which may be over $750 billion, investor should ask if banks are broken. With native rates throughout Europe, one has to ask why investors would pay someone to hold their savings. A simple answer is that the next best alternative is worse. Would you want to be a debt holder in bank which has an uncertain future or would you rather have a certain loss with a negative yielding government bond? With more regulation and capital requirements, it is not clear that banks will be profitable without restructuring of their core loan portfolios. Hedge funds are supposed to generate alpha which is the excess returns that are not associated with market risk. For more sophisticated investors, alpha could be the excess return after accounting for a set of market risk factors such as the Fama-French model. 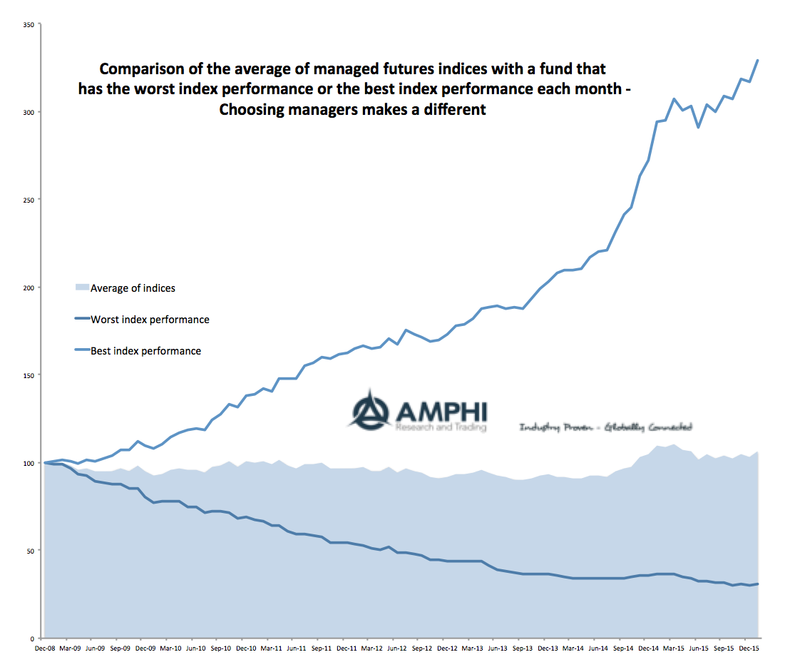 The data is clear that there exists a positive gross alpha of 6-10% which suggests that holding hedge funds is a good thing even after accounting for fees. Or, at least, this is the conventional story. A more nuanced story has arisen which is quite interesting and may change your view toward hedge funds. This story is that alpha is actually the compensation for taking downside risk from hedge funds. if you form put selling strategies against the market index, you can actually explain the alpha that is generated by hedge funds. See the paper “The cost of capital for alternative investments” by Jakub Jurek and Erik Stafford. 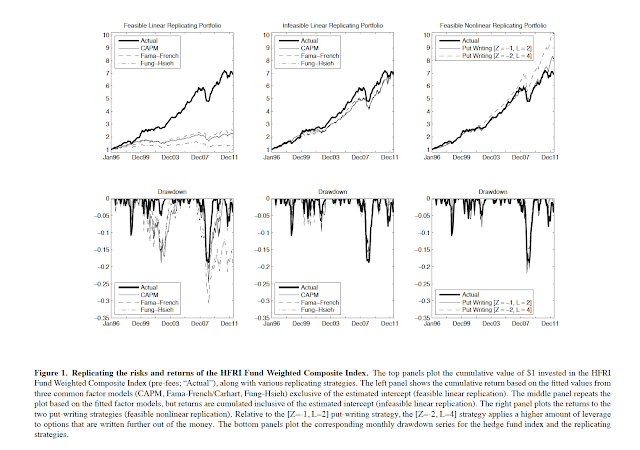 This is a very important paper for investors in hedge funds. It truly is a game change for portfolio construction. Hedge funds will give you higher stand-alone returns because you are being compensated for the downside risk of market extremes. This paper is clearly written but there are a lot of assumptions necessary to generate these results. The authors are very careful with how the generate there results, but everyone may not agree with the conclusions. This result is consistent with our view of convergent and divergent trading. Many hedge fund managers are creating portfolios that generate alpha similar to put-writing because they are exploiting relative value. In essence, they are convergent traders who make money when markets are mean-reverting and prices stay away from extremes. For investor, you have to think about the mix of hedge funds within your portfolio differently. If you are going to hold traditional hedge funds and this market extreme risk, then you should also hold those managers who will do well in market extremes. These managers would be divergent traders. This would include global macro and managed futures funds. Not all of these managers will be divergent, but it does make sense to divide the world differently than the common approach of looking for alpha producers. Market prices diverging from macro data - signal of ruin? These market signals seem at odds or at least an exaggeration versus the macroeconomic data. While the global macro data suggests slow growth and continued weak inflation, it is not signaling recessions in the developed world. We can look at probability models which show increased risk of recession, but the numbers are still at relatively low levels. Forward looking view - Market prices are forward expectations of the real economy and it is sending a signal of a major slowdown with banks being in trouble. Over-reaction to past prices view - Market prices are in a negative feedback loop which is over-reacting to some slower macro data. Selling has begot more selling but the macro data suggests this is an over-reaction. Look for a reversal in price data. 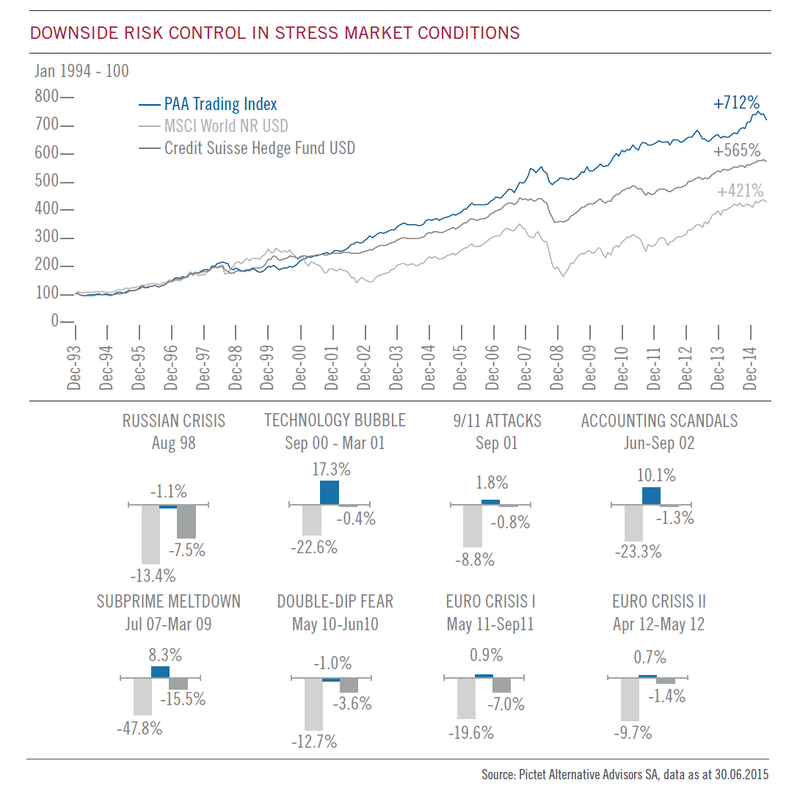 Combination story or RO/RO view - The world is focused on changing risk-taking and right now we are in risk-off mode. There is heightened risk in the markets and economy. The markets have reacted to this risk or uncertainty information. 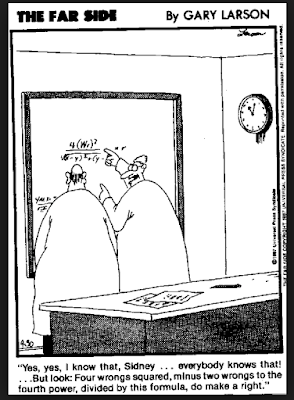 Current monetary policies are confusing. Macro data are mixed.The central bank policy of negative rates is negative for banks and not as effective as previously thought a few years ago. Hence, there has been a sell-off which has changed risk perceptions. We are in a risk-off environment and policy cannot change this view. The most likely scenario is the RO/RO world where changing risk perceptions are forcing a repricing of assets. This will continue until there is a catalyst to change risk perceptions. It could be a policy statement or new data, but right now it will continue. It is not an over-reaction or herding but a new view that safety is more important than reaching for yield. If banks are also in risk-off mode, there will be less lending and more holding of cash which should reduce earnings and cut ROE. In this case, the price investors are willing to pay for banks should fall. The RO/RO environment with a focus on the Risk-off is consistent with the periods between the QE's post Financial Crisis. There is a special power with diversification. You can have a situation where two negative return streams can be blended to form a positive return. This does not occur in all cases, but these situation does exist. This has been called Parrondo's Paradox. “It is a phenomenon that we discovered 10 years ago which consists in two gambling games where the trend of the games is losing in average, that means if you play the games separately you will lose, but if you play alternate them, randomly or following several sequences then you will win in average." The paradox was based on game theory and has generated whole conferences on the conditions for how it works. There are some key assumptions associated with the paradox but the fundamental idea has some sound logic. See the finance paper by Mike Stutzer. The paradox can be generated through rebalancing of two assets. The alternating between two losing strategies can lead to a positive return. This would not occur with a buy and hold strategy. Never under-estimate the power of rebalancing whether at regular intervals or through a deviations from a target. This applies to any portfolio strategy. Investors have seen a surge in market turbulence. There has been significant price dislocations and a rising flight to safety by many market participants since the beginning of the year. Consequently, it is important to look at strategies that may do well in this type of environment. Hedge funds, in general, will provide diversification protection because they have less beta exposure. 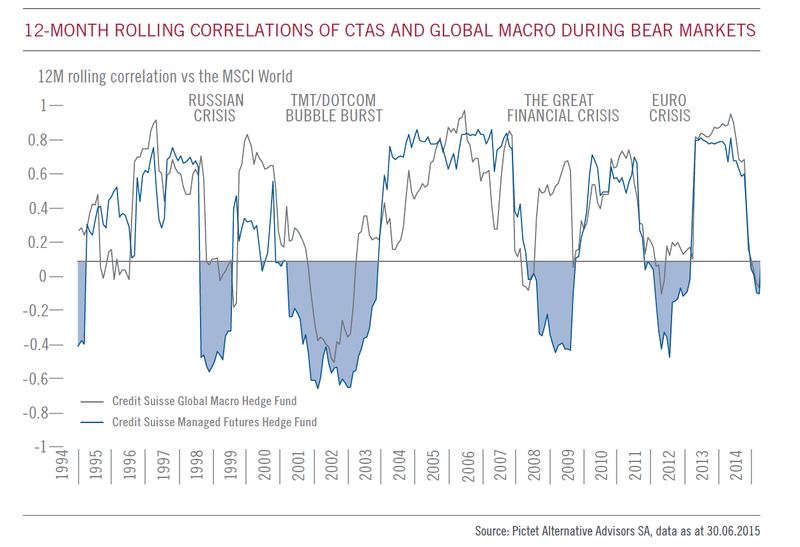 Less directional risk will mean lower correlation with the overall markets, but that lower risk exposure does not mean hedge funds will be able to exploit opportunities from turmoil. However, there are strategies that work well under market turbulence. 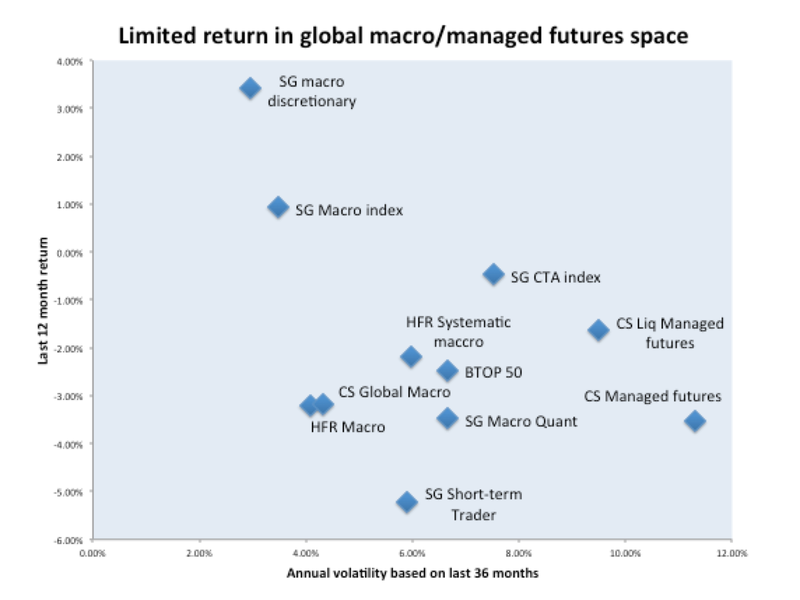 Global macro and managed futures can do well during these difficult times as evidence by their past conditional returns. From "Hedge funds: The case for trading strategies" Picket Alternative Advisors SA shows the value-added from these divergence strategies in three ways. First, during periods of stress, managed futures will outperform direct beta exposure in equities. Second, correlations change during periods of stress. There is more diversification available at these critical times. The ability to go both long and short allows for negative conditional correlations with equity markets. 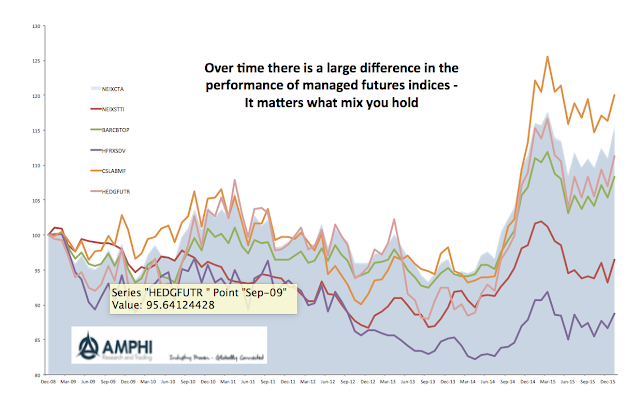 Third, a combination of global macro and managed futures will do better than equity markets or hedge funds. Of course, investors may not be able to predict when these crises or periods of turbulence will occur, but holding some exposure in managed futures and global macro will provide added portfolio diversification when needed. These strategies offer more convexity to investors. We like to say they are anti-fragile. There has been a significant amount of research on the value of managed futures when there is a crisis, but most of the work has been empirical. The results show that there is a strong negative correlation between managed futures and large stock declines. This conditional correlation has been referred to as crisis alpha. 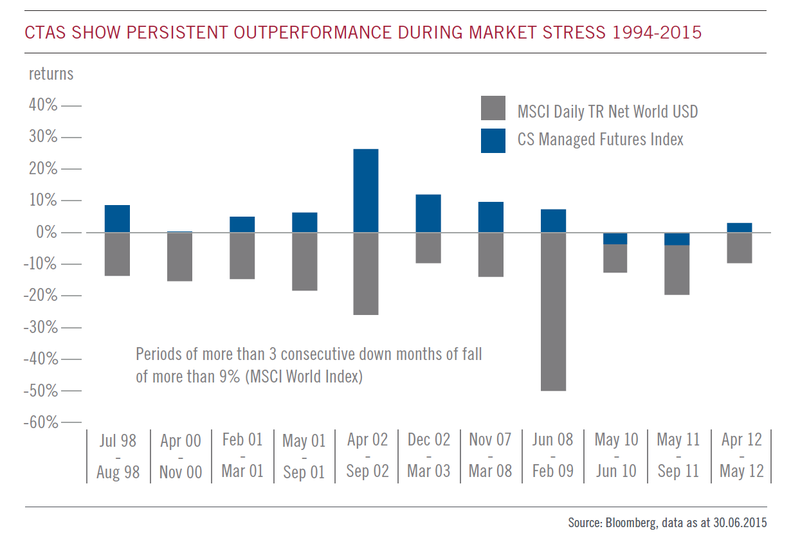 Crisis alpha is measurable, but there has been little discussion on why markets dislocate and why some strategies such as managed futures will do well during these special times. I have referred to the advantage of managed futures during these crises as divergent trading. Managed futures managers make money when markets are mean-fleeing, but that is a description of what the strategy does and not why it will make money. Nevertheless, a recent paper in the American Economic Journal: Microeconomics provides some insight on why divergent trading may be successful. It does not discuss managed futures or investment strategies but focuses on the bigger issue of why markets may dislocate. The paper is called "Falling Dominos: A Theory of Rare Events and Crisis Contagion" and was written by Heng Chen and Wing Suen The paper's premise is game theory approach with Bayesian learning. Rare events can lead to crisis contagion when market participants start to rethink how the world operates and change their perceptions of the environment. Think of the world as falling into two states, tranquil and frantic. You are not certain which state you are in. More importantly, if you have some rare event, it may shake your guess on the state you are in. If there is a rare trigger event, belief revision can lead to contagion because you will think the "attack" which caused a crisis is more likely to be successful. The next attack could be stronger and the defender may be less able to protect against this attack. A rare financial crisis may be a good example of a trigger that can cause investors to change expectations. When this change occurs, investors will likely start to reprice assets by thinking a crisis is more likely somewhere else. In the case of the Asian crisis, a rare event in one country started to spill-over to others as investors thought a crisis would be more likely elsewhere. 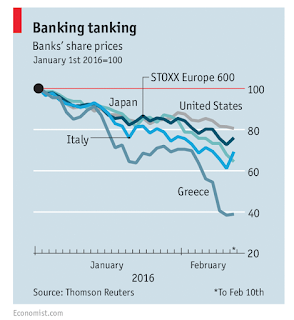 A large bank failure could easily trigger a view that other failures are possible. A credit failure may cause investors to think that other firms are also weaker. The model is not about herding but a rational updating of expectations. Once the revisions of expectations start to spread across market or countries, there will be price divergences and dislocations. The sum of dislocations, correlated divergences, will mean those that trading the dislocations or trends will be profitable. The diversification that may normally exist may hamper the size of trading gains, but a correlation or contagion of expectation changes will mean those strategies that have positive convexity or crisis alpha will be more profitable. This is a simple explanation but one that should suggest that positive convexity strategies have value when rare events occur. The global themes have changed radically in the last month. At the beginning of January, the market was thinking about four moves from the Fed in 2016, higher growth, and global monetary divergence. Now, the markets have growing fear of a recession albeit about 20%, a Fed that may be done in 2016, and monetary convergence as all central banks become QE-followers. The most likely reality for 2016 will be somewhere in between these extremes, but the fear of deflation, recessions, and adverse credit and capital flow is real and points to a more volatile year. We think the RO/RO environment seen between QE transition periods is a a good starting point for any strategy discussion. Hedge funds are supposed to hedge. This means that they generally will have low correlation with traditional assets and will have negative correlation especially during negative market moves. There are a number of ways to measure this effect including dynamic conditional correlation. This times series measure was developed as a means to account for the fact that correlations across assets are not stable. We will not go through the math but being able to account for changing correlation is extremely helpful when trying to build portfolios. 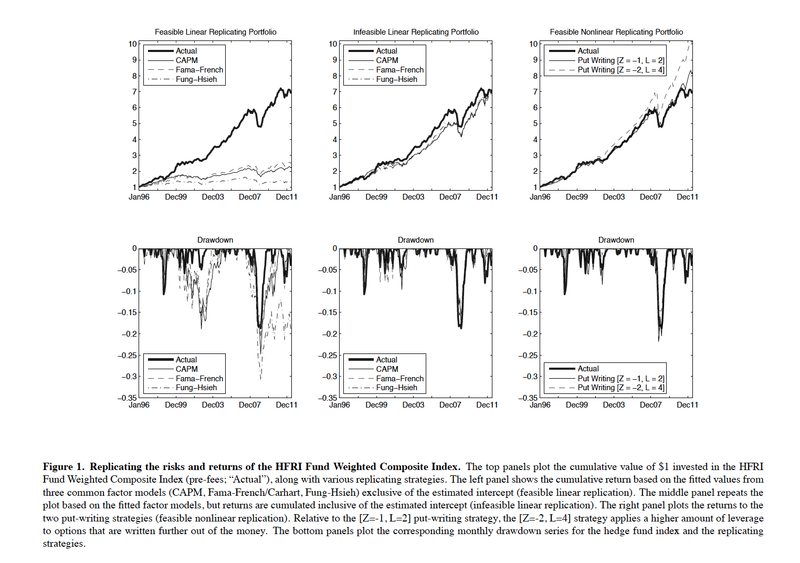 The simple hedge fund study "Reducing Stock Risk with Hedge Funds" by Ratner and Chiu does not show new results but provides some better insights on the value of hedge funds and portfolio construction. Hedge funds do have lower correlation with traditional assets as measured by the HFR fund of funds and fund weighted composite indices. There is no surprise here. The authors also find that hedge funds do not really hedge when extreme moves occur. Hedge funds get you some protection but not as much as you may like. The dummy variables to measure changes in correlation during periods of large stocks moves show no significance. There is no extra benefit. The authors also there limited extra benefit during financial crises. 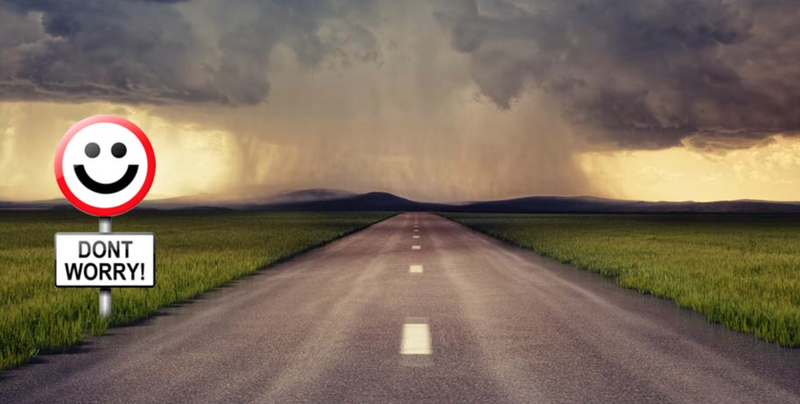 If you want to protect against a crisis or a large stock move, it requires a deeper dive into the specific strategies that could account for the protection. This is why we have divided the world into convergent and divergent strategies. If you want to protect against an extreme move or a crisis, just holding an alternative portfolio is not good enough. Strategies like managed futures or global macro which generate more positive convexity and do better in divergent environments are more helpful for investors. Those strategies that do better during periods of market convergent or mean reversion may add diversification benefits but may not do well in crises or market extremes. Knowing strategy differences and why you want to hold alternatives make a big difference with portfolio construction. How many surveys say, "Investors are increasing their exposure to alternatives"? Well, there is a world of difference based on what strategy you choose. This differences becomes especially apparent when you see performance at extremes like January. 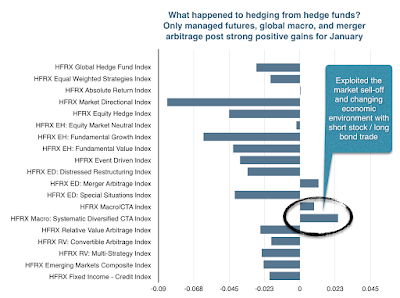 Using the returns from the HFR indices, the only hedge fund strategies that generated positive returns were managed futures, global macro, and merger arbitrage. The absolute return index posted only 42 bps which we are not including with the top three. Merger arbitrage continues to be driven by deal flow. The rest of the strategies have some level of beta and posted negative returns. 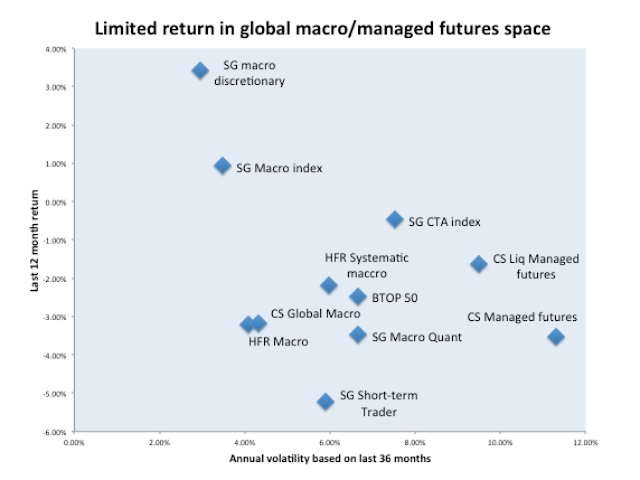 Managed futures and global macro were able to combine short equity exposures with long bond risks to generate significant returns. The risk-off switch from risky equities to safe bonds worked well. Additionally, these traders were able to generate gains in currencies and from the continued fall in commodities. The big loser was the market directional index which well exceeded the lose in the S&P 500 index. A number of strategies were not able to get out of the way of the equity decline and posted negative returns of over 2%. Of course, a month does not make a year, but hedge funds diversified returns but did not hedge this month. January focuses the discussion on our two style breakdown of convergence and divergence traders. When there is a strong market dislocation, the divergence traders like trend-followers, will do better than those that bet on stability and convergence. If you think global economics are changing and the investment world is characterized by dislocations, you have to ask, "How much exposure do I have to divergent strategies?" Its is still early in the year and looking at the alternative allocation in detail makes sense to ensure you have enough divergent strategy exposure. When there is a market dislocation or divergence, there will be good opportunities for managed futures. January saw an equity sell-off, continued downward pressure on commodities, and economic expectations for slower growth. Many of these themes began in December and were clearly were strongly displayed in price. CTA's had their best month in a year with a monthly return of over 4 percent for the strategy index. This was significantly better than the S&P 500 and MSCI World equity indices. The Soc Gen CTA index also outperformed the Barclays Aggregate bond index which only gained a little over 1 percent. The CTA index also posted positive returns versus the Bloomberg Commodity index (DJP) which fell almost 4 percent. The only asset class that outperformed managed futures was the long bond as measured by the TLT ETF. 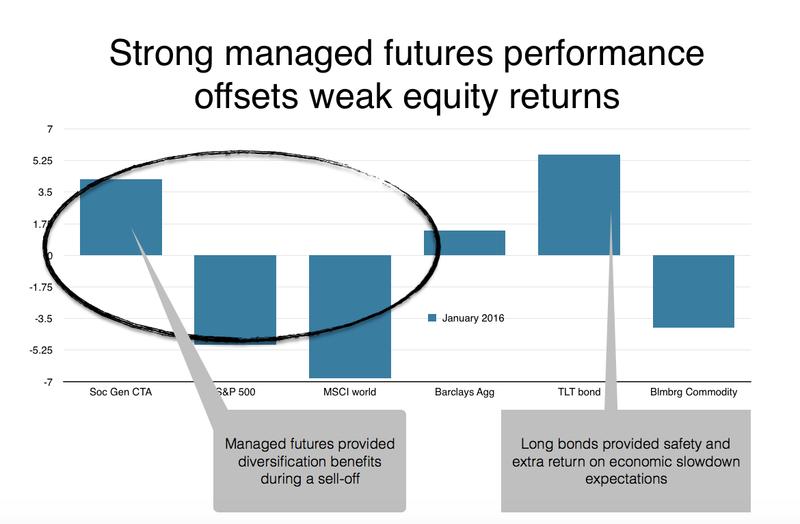 The positive correlation with the long bond but slight relative underperformance tell the strategic story behind managed futures. Managed futures gains from holding both long and short positions across a diversified set of derivative markets. It can profit from being both short equities and long bonds. However, the strategy diversification means that when there is a extreme flight to safety managed futures may not be do as well as a concentrated bet on the safe asset. Of course, the ex post holding the safe asset with long duration was the best call, but it would not have provided any safety if the equity sell-off did not occur or the negative correlation did not continue. Managed futures as measure by traditional trend-followers provides global major diversification based on a strategy of divergent trading. 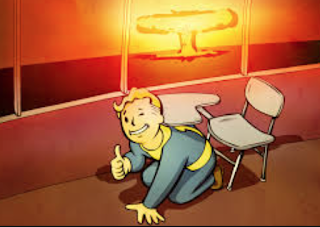 The strategy generated crisis alpha. As we enter February, the key managed futures issue will be position management. 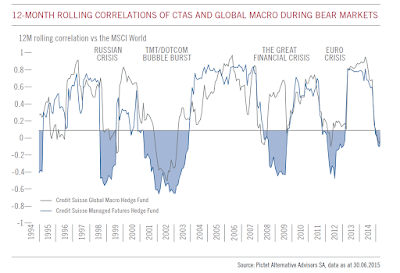 If the current market divergences stop, can CTA's control risk? 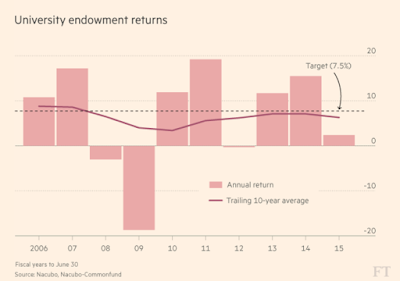 Endowments under pressure - are alternatives the solution? Most surveys suggest that endowments and pensions have been increasing their alternative exposure. The reason may be clear when you look at 2015 performance. There is a huge gap between a target return of 7.5% and the actual returns from endowments. Of course, the ten -year average is closer to the target, but 2015 was not a good year and this was before the sell-off in August. Low rates coupled with Fed normalization mean that the fixed income portion of a portfolio is unlikely to have total returns close to the 7.5% level. The first month of the year has not sent a strong signal on equity performance. Credit markets have been in upheaval and commodities have continued to slide lower. So where is the 7.5% going to come from? The only alternative is to gain returns through high alpha generation. This is not really realistic but it seems to be the place where investors are willing to place their bets. It is a semi-defensive strategy of protecting against a sharp decline through diversification under the hopes that returns can stay at least close to the target. It makes sense in a world filled with uncertainty and the expectation that traditional assets will under-perform. The key issue with any expectations market is that investors are often driven by what is perceived and not what is true. The misperceptions of what we belief to be fact but in reality is false will clearly drive markets. 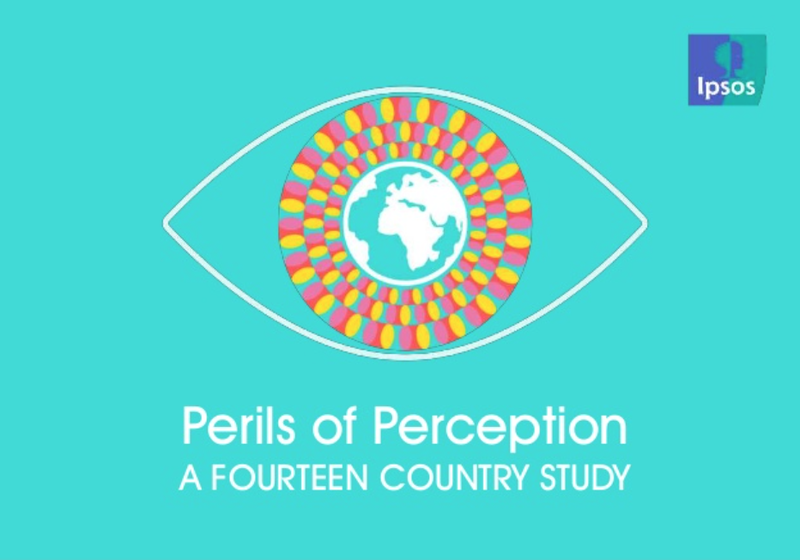 If you don't believe we have perception problems, look at the survey of the Perils of Perceptions from Ipsos Mori, the British research and survey group. The fourteen country survey asks very simple questions on simple facts that should be easily answered by most individuals. It is not that the questions are always easy, but they do represent facts of what people should know. You can take the test yourself. Generally, the perceptions of individuals around the world show significant differences with reality. If individuals cannot anchor basic facts, then it is likely they will have a problem assessing new information. 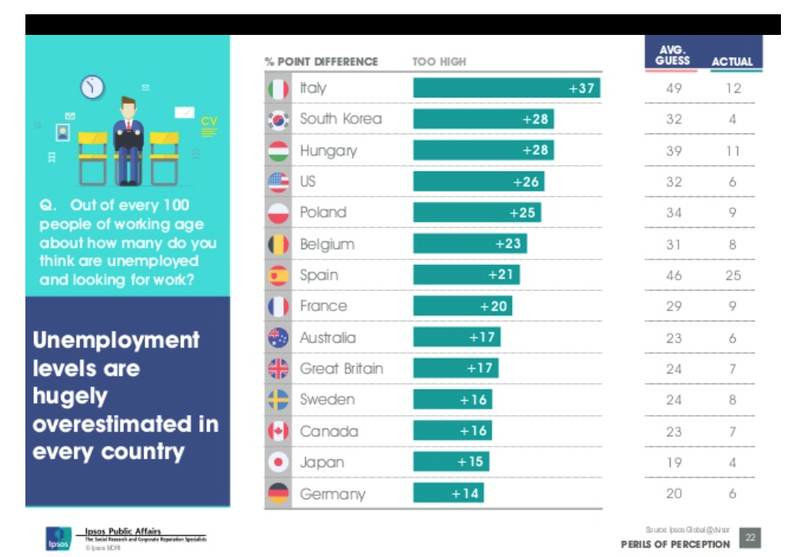 Take, for example, the perception on unemployment. The numbers suggest that most individuals, regardless of country, think unemployment is higher than it actually is. 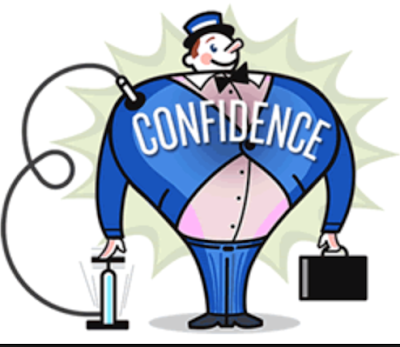 No wonder there is a problem with confidence in the economies around the world. Being blind to reality will mean that assessing new information will not be easy. You cannot effectively change expectations if you don't know the starting point for discussion. Take the survey and check your misperceptions.